Superhero comic books descend from the pulps. That is, they are a product of a massive surge in genre fiction produced in the early decades of the 20th century. Look at your favorite superheroes today, and you can still see the traces of this lineage. It’s not as if fantasy, science-fiction, or detective stories hadn’t existed before 1900, but so many of the expectations and conventions that genre fans take for granted today were only created and codified after the turn of the century. Many of the people who got in on the ground floor of the Golden Age of comics had experience with pulp magazines like Amazing Stories and Weird Tales as writers, editors, or devoted fans. Edgar Rice Burroughs began his Barsoom series in 1912, with the serialization of “Under The Moons Of Mars.” These books, detailing the adventures of an Earth man named John Carter stranded on Mars and swept up in a series of wars and adventures, was one of the first examples of what would later be known as “planetary romance”—a subgenre of sci-fi adventure stories. If the name John Carter sounds familiar, it was also the name of a box-office bomb released two years ago, ostensibly to celebrate the 100th anniversary of the character’s creation. The fact that so many viewers and reviewers criticized the film for being a predictable retread was actually, oddly enough, something of a tribute to the enduring strength of the source material: Burrough’s books have been so thoroughly ransacked by succeeding generations, for everything from Flash Gordon to Buck Rogers to Star Wars, that any faithful adaptation was bound to seem at least a little familiar. Despite the trappings of rocket ships (or light-speed engines, or space folding), there’s always been a vein of fantasy at the heart of planetary romance that sets it apart from the realms of so-called “hard” sci-fi. Hard sci-fi limits itself—or at least tries to limit itself, for the most part, although it’s a rare writer who doesn’t admit to cheating occasionally—to stories that can be told with reasonable extrapolations of current scientific understanding. It’s usually fairly easy to tell the difference between hard and soft sci-fi: Does the story have any kind of faster-than-light travel? Although scientists love to formulate theories (and popular science writing is full of ideas) as to how, maybe, somehow, under certain circumstances, by fudging some data, faster-than-light travel might be remotely possible, the current consensus is that physically traveling between star systems at warp-speed velocity is impossible. Whatever sci-fi trappings a writer might put on it, FTL-travel is pure fantasy, at least for the moment. Cosmic doesn’t even have to be sci-fi at all, even if much of what we identify as cosmic is—Dr. Strange is a character of pure fantasy, and yet he has no problems gallivanting around a recognizable universe of distant stars and galaxies. Neil Gaiman’s Sandman is another fantasy character who indulges in the occasional bit of cosmic adventure. H.P. Lovecraft’s horror fiction dwelt in the margins between fantasy and sci-fi, creating a cosmology of interstellar entities and alien races that was also fueled by dark magic and necromancy. All of which is to say, when we talk about “cosmic,” we’re talking about a lot of different things, but mostly we’re talking about fantasy adventures that take place in a roughly sci-fi universe. But because the genre boundaries are especially porous, there’s a lot of slippage, and in fact, this slippage is often where the most interesting types of stories originate. 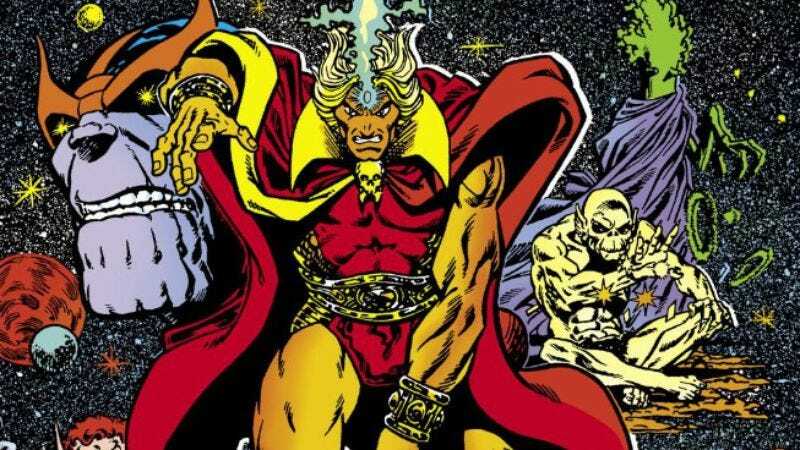 Jim Starlin’s Warlock is perhaps the best cosmic story ever told in comics. This may be a controversial opinion, but it’s not entirely without some basis in consensus, either. Warlock is a character with a unique pedigree. He was originally created by Stan Lee and Jack Kirby in the pages of Fantastic Four in 1967, a scientific experiment by a group of unscrupulous scientists trying to create a “perfect” human. As could probably be expected, that didn’t go so well, and the creature—originally titled, simply, “Him”—rebelled against his masters. In his first appearances, the character was a naïve child, just born and already incredibly powerful. He next appeared in a slugfest with Thor, precipitated when Him tried to mate with Thor’s girlfriend for the purpose of propagating a race of perfect children. After this fails he sets out for the stars to seek his destiny. It’s at this point that the story gets interesting. Him, while technically a Lee and Kirby creation—with all that pedigree entails—faded from sight very early after his premiere. In conception he was closer to Kirby’s original ideal of the Silver Surfer, an artificial man created by Galactus and completely unfamiliar with human life (as opposed to Lee’s subsequent reinvention of the Surfer as a man named Norrin Radd who had sacrificed himself and his conscience to save his home planet of Zenn-La). The problem is that, as given, Him wasn’t a particularly interesting character. There were only so many stories that could be told about a godlike child wandering around the universe getting into misunderstandings. Roy Thomas plucked Him out of obscurity in 1972 to relaunch the character, along with Gil Kane, as Adam Warlock. Thomas, equally influenced by late-’60s touchstone Jesus Christ Superstar and Jack Kirby’s early-’70s Fourth World saga, consciously recast Warlock as a messiah figure, sent by his adopted father, the High Evolutionary, to watch over the progress of Counter-Earth, a planet-sized biological experiment constructed by the Evolutionary on the far side of the sun from the real Earth. Eventually a demonic villain arose, The Man-Wolf, who threatened to destroy Counter-Earth, before Warlock sacrificed himself to save the planet. He rose three days later, with a little help from the Hulk—certainly the oddest apostle. Before Jim Starlin, Warlock was already a distinctive character, and Thomas’ run (aided by writers Mike Friedrich and later Gerry Conway, who fleshed out Thomas’ template) is worthy of remembrance in its own right. But it’s when Starlin enters the picture in 1975 that the character fully comes into his own. Even Thomas admits in his 2006 introduction to a collected edition of his Warlock stories that Starlin’s Warlock was “perhaps the most ‘cosmic’ series in the history of comic books.” If Thomas’ religious allegory had already stretched the limits of possibility in superhero comics of the early ’70s, Starlin’s run would push the genre almost to its breaking point. Starlin was a decade younger than Thomas. In Vietnam, he had served in military intelligence, and saw firsthand the parts of the war that weren’t yet making it to the stateside news. Like many younger Marvel writers at the time, he was also quite familiar with mind-altering substances. Whereas the previous generation of Silver Age creators had been content to have their works embraced by the counter-culture, Starlin—along with fellow Bronze Age radicals such as Steve Englehart and Steve Gerber—was the counter-culture. Thomas’ cycle of Warlock stories (as completed by Gerry Conway) ended with Warlock leaving Counter-Earth to once again travel the stars. The first issue of Starlin’s Warlock in 1975 finds our hero already an experienced cosmic traveler, attempting to save a damsel in distress from a gang of interplanetary religious fanatics. It turned out that the damsel in question had been looking for Warlock in the first place, in order to compel him to help resist the power of the genocidal Universal Church Of Truth. And in a further twist, we learn that the founder and living God of the Universal Church is none other than Warlock himself, via the wonders of time travel. This was the next logical step for the character after Thomas’ allegory. After serving as a living messiah in a baroque Christian pageant, Warlock grew through to adolescence and settled on the part of a brooding, existential rebel. Warlock rejected organized religion—a reflection of Starlin’s own feelings toward the Catholic Church—and was set on a path of destruction that could only end, somehow, with his own self-annihilation. The original planetary-romance stories had been rapturous odes to the joys of Western cultural and military imperialism. Influenced by Victorian adventure writers such as H. Rider Haggard, early sci-fi adventures usually focused on a white male protagonist thrust into dangerous circumstances on distant planets, made to fight for the salvation of benighted (green, blue, or red-skinned) subject races. Flash Gordon’s nemesis is even named Ming The Merciless: The Orientalist subtext wasn’t buried very deep. Eventually real-world political concerns caught-up with sci-fi, and new narratives—like Frank Herbert’s Dune—arrived, taking as their premise the understanding that imperial hegemony was a deadly foundation on which to build any kind of swashbuckling romance. Similarly, Starlin’s experiences had shown him what happens when technologically superior military forces attempt to dominate ideologically “inferior” subject peoples. It wasn’t a far leap to go from his career processing photographs of bomb craters spread across the Ho Chi Min Trail, and a childhood spent under the corrosive influence of Catholic primary-school education, to the creation of a galaxy-spanning repressive church dedicated to the eradication of all infidels and non-humanoid aliens. That the figurehead of this evil church was a funhouse-mirror version of Warlock himself, named The Magus, was just one step farther into juicy, nihilistic, adolescent angst. Starlin’s Warlock was an anti-imperialist narrative created as an express rejection of religious oppression and a pointed critique of corporal might welded to ideological fanaticism. It was also a psychedelic tour de force whose storytelling seemed to have been directly influenced by the Underground comix that were only just then, in 1975, beginning to fade from relevancy. Starlin’s detail-heavy, intricately fussy drawings would have fit well next to those of Gilbert Shelton or Robert Crumb. Warlock was as druggy as comics were allowed to get in 1975. In one issue, Warlock is put on trial by a twisted kangaroo court, prosecuted by a giant mouth, defended by a mute eyeball, and sentenced by a jury of plastic mannequins. In another, Warlock is trapped in his own mind, forced to contend with a psyche full of demented clowns and the incarnation of his own incipient insanity in the form of a giant purple wrestler named The Madness Monster. Throughout the run, Warlock is forced to contend with yet another source of madness in the form of the vampiric Soul Gem placed upon his brow by the High Evolutionary—a destructive artifact constantly lusting to absorb the souls of Warlock’s fallen foes. It’s necessary to note that Starlin’s run on Warlock was also the first time Warlock encountered Starlin’s signature creation, Thanos. Thanos appears in Warlock’s story as a disruptive element determined to counterbalance The Magus’ own baleful influence, primarily because a dominant Magus represents a significant threat to Thanos’ own plans. These early issues outline the dynamic that would power every future encounter between Thanos and Warlock: Both see the other as an intolerable interloper, while at the same time being drawn together time and time again in order to survive. While there was evil in Warlock’s universe—coercive temporal and spiritual power, a theme to which he would return in his creator-owned Dreadstar series—there were also an infinite variety of different shades of gray. The relative positioning of allies and enemies changed depending on each character’s perspective. Thanos’ adoptive daughter Gamora, the self-styled “most dangerous woman in the galaxy,” later became Warlock’s lover. His only friend was a morally degenerate troll. His greatest nemesis was himself. The beauty of science-fiction—and, while I have nothing against the intelligent men and women who produce good hard sci-fi, I’m mostly talking about the soft stuff here, the stuff with the least amount of self-imposed restrictions—is that, as a genre, it is capable of doing just about anything. If you accept that we’re going to bend the rules enough to enable our heroes to jet across the galaxy at a moment’s notice, well, you can extend that suspension of disbelief pretty far. You can have spacemen, you can have sorcerers, and you can even have spaceman sorcerers like Adam Warlock, who soar across the universe in the time it takes the reader to turn the page. Cosmic sci-fi at its best is pure, unadulterated metaphor: Everything is as far from our quotidian Earth lives as possible, so just about any topic can be broached. It’s not a genre that rewards restraint. If you want to do a story about genocide and insanity and religious repression, fortune favors the bold. Give us a tortured reluctant hero whose only recourse to save the universe is to travel forward in time to kill himself. Pop the latch on the top of your skull and give us every monster that ever crawled out of your superego. It’s not random, and it’s not arbitrary. It all makes sense according to the peculiar, surreal logic of your strangest dreams. We are such tiny creatures, stranded here on this rock spinning around an obscure star. We are an infinitesimal part of an enormous universe. Stories about the nature of the universe and our place in it are a way of working through the essential misery of being limited and finite. Starlin used Adam Warlock as a vehicle to work through some of the most painful experiences of his life. The true meaning of “cosmic” is not just that it’s a type of sci-fi influenced by fantasy, but that it’s a genre defined by the freedom allowed the creator to construct any conceivable type of metaphor to explain his or her world. We find ourselves reflected even in our most outrageous fantasies.